Black Moon I s a classic hip hop group made up of Buckshot, DJ Evil Dee and 5ft. If you haven't heard of Black Moon before or Enta Da Stage, you now know of another classic album released in 1993 aka the midst of the time people refer to as the Golden Era of hip hop. I have mixed feelings about calling that time the Golden Era. There was definitely something special going on then. The shift in lyricism, dj-ing and musical production changed so much that it's hard not to be nostalgic. Also, the sheer number of classic albums that came out within 5 years is hard to believe. When you look at all of the different hip hop scenes that emerged as well, you get a good idea of the amount amazing duversity of music put out. My hesitation to call it the Golden Era comes from the fact that a lot of classic hip hop is coming out each year and it's possible that another wave could happen. Either way, Black Moon made a lasting imprint during a significant time in hip hop. War Zone came 4 years after that culture high and while commercial rap dominated hip hop's representation in the media. War Zone is equally impressive as Enta Da Stage because it was so consistent and it represented Brooklyn to the fullest, as you would expect from Buckshot and Duckdown. The only thing that War Zone didn't succeed in was commercial success, but the music speaks for itself. This abbreviated list shows how concentrated talent was and it all emerged through a medium that was yet to reach it's potential (the music video). You used to be able to turn on The Box, Yo MTV Raps or Rap City on BET and you could see videos from those underground artists that now make their way on the internet. It made you appreciate the music video (as a new medium) because it was like a window into another world. Nobody crosses the country to see the ghetto and hip hop connected a disjointed community by celebrating it's differences. In the end, other issues regined supreme ($$$) as beef between certain icons shaped the perception of east, west, north and south. But it doesn't negate how this time highlighted the best and worst of the hip hop community. In my opinion, the good outweighs the bad because of artists like Heltah Skeltah, The Pharcyde, Smif N Wessun, Black Moon, OGC, Redman, The Roots, Beastie Boys, Big Daddy Kane, Jungle Brothers, Oukast, Dr. Dre, Run DMC, Snoop Dogg, Common, Masta Ace, Slum Village, EPMD, The Ghetto Boys, Heiroglyphics, Goodie Mob, Wu-Tang Clan, Mobb Deep, Ice T, KRS One, A Tribe Called Quest, De La Soul, DJ Quik, Easy E, Public Enemy, Slick Rick, Gangstarr, Busta Rhymes and Leaders of the New School, Keith Murray, Lost Boyz, Big L, Eric B and Rakim, N.W.A., Jeru tha Damaja, Too Short, Kool G Rap, Ed OG & the Bulldogs, LL Cool J, Cypress Hill, Nas, Jay-Z, Ice Cube, 2pac, Onyx, Das EFX and the list could go on. In addition to all of the solo and group albums released during that time, movie soundtracks were like a gold mine for amazing singles. Who didn't have the Bad Boys soundtrack? It was at this time that hip hop's transition from being an underground movement to a worldwide phenomenon finalized and it captured the imagination of the world (myself included). 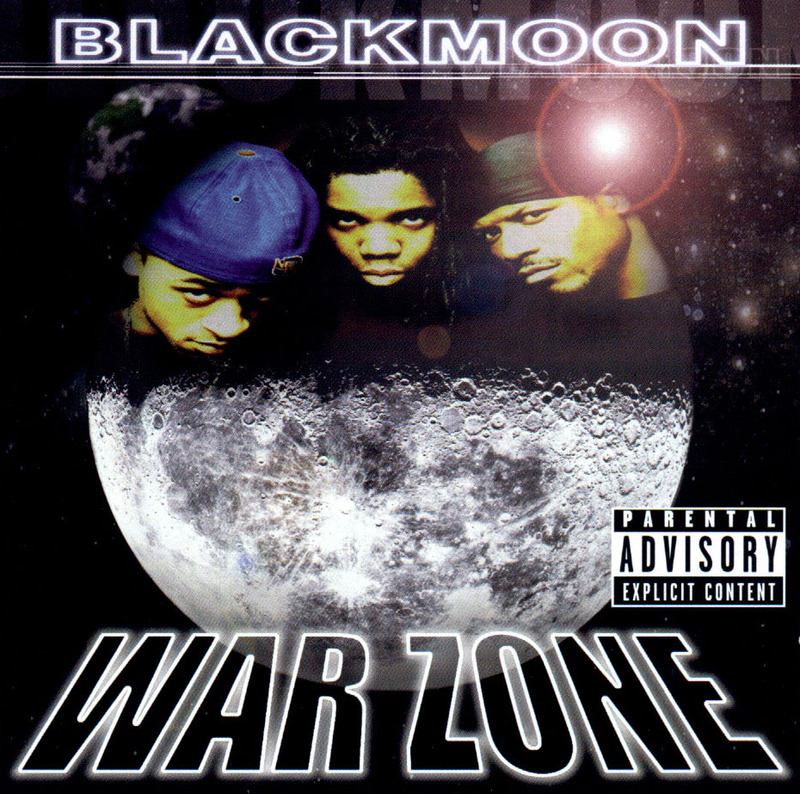 Getting back to War Zone, it was the sophomore album from Black Moon, a group of pioneers. A significant amount of time passed between their first and second album, but they had a lot of other projects going on. Buckshot is the CEO of Duckdown Records and that in itself is something special. When you look at all of the classic albums and combine them with the instant classic albums put out since the year 2000, you can see how Duckdown Records effected hip hop. Did I forget to mention that Duckdown is an independent record label? Much respect to Duckdown for it's consistency and for it's ability to sign and develop amazing talent. Just yesterday, I picked up Skyzoo's mixtape called The Great Debater. It is a testament to Duckdown and what it stands for. War Zone is one of those classic albums that many overlook. I'm sure there are people that think, "if it's such a classic album, people wouldn't forget about it". And the only thing I can say is that's a simple minded approach to a complex issue. Nothing in life is that simple. Many classic albums are swept under the rug as each year passes while younger generations absorb what's hot and new. Just because the world keeps on turning doesn't mean that what someone created yesterday is insignificant. So, to pay homage to those classic albums, I write about them as much as I can. For those that can't stand the direction of hip hop, I write this for you in the event that you haven't heard it before. Also, I write this to expose younger people to music that dropped when they were too young. Before the internet was as widespread as it is today, it was a lot more difficult to know what albums dropped across the country. Finally, for those that are always looking for great music, regardless of the genre, I write this for you too. The Bootcamp Clik takes the Brooklyn battle style literally and metaphorically to a level that defines an attitude and style. Discipline, talent, dedication, brotherhood and loyalty all come into play and you can hear the chemistry in the Bootcamp Clik albums as well as any track when 2 or more artists from Duckdown get together. M.O.P, Louiville Sluggah, Teflon, Starang Wondah, Q-Tip, Rock, Tek and Steele, Heather B and Busta Rhymes are all featured on the album and they maintain a consistent raw sound that solidifies War Zone as a classic. If you like the videos and tracks in this post, they are just a small sample of what the full album has to offer. I seriously had problems deciding what tracks to embed in this post.